A show of hands from the floor confirmed that those present were almost unanimously either experiencing change, had recently done so, or were anticipating it. So on that evidence alone, they and their organisations are continuously looking for ways to improve and therefore will not be forgotten! The afternoon / evening event consisted of three case studies and a panel session, with the participation of Jacqui Alexander and Margaret Huggins from GSK, Madhuri Warren from Pathology Diagnostics introduced by Tony Jones from One Nucleus, John Burt from Abzena and Chris Mayo from the London Stock Exchange, and Edward Hooper from Taylor Vinters. 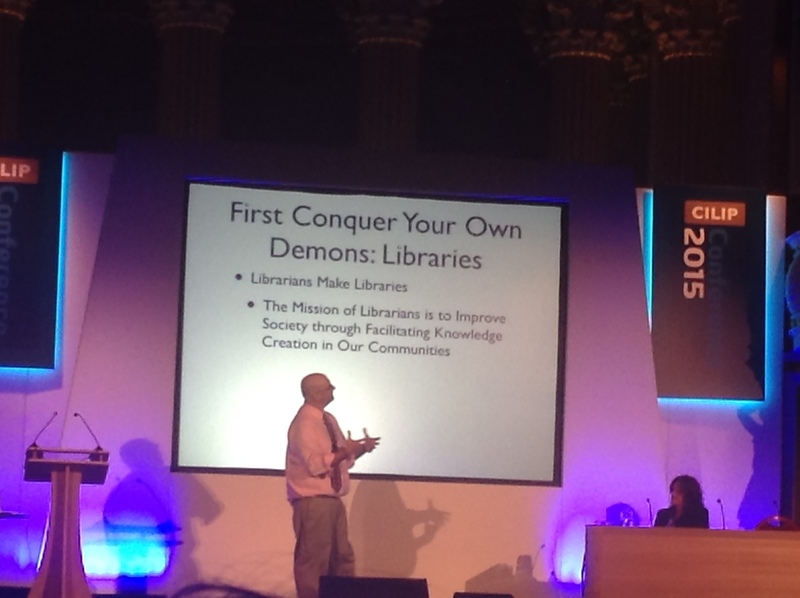 I had the pleasure of introducing the first session with GSK, and chairing the closing panel discussion. It was a very enjoyable event, with a richness of content and some great discussion. This blog does not attempt to cover all of the content, but rather to explore some of the key themes that emerged in what felt like almost a celebration of change and how to make it a more positive experience. I asked the delegates what would make the difference for them between experiencing change as something really positive and constructive, as opposed to something negative and really rather awful. 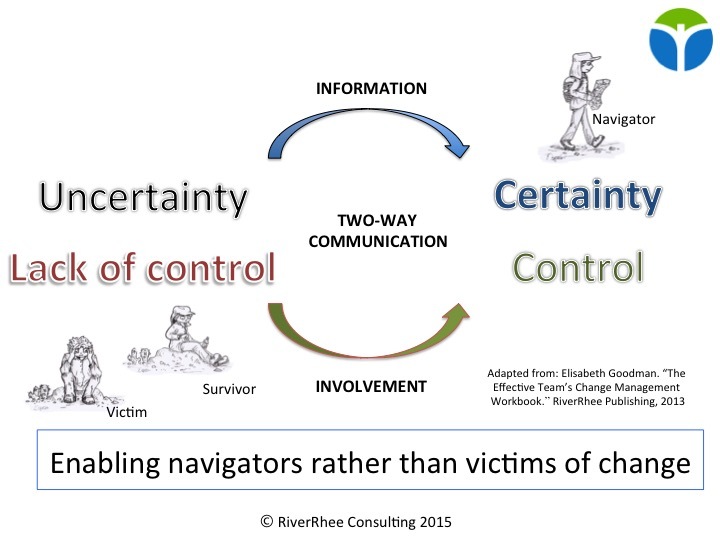 The answers that came back included attitude, knowing what was going on, and being in control – a nice lead-in for my slide on enabling navigators rather than victims of change (a theme that I’ve previously spoken about in my capacity as committee member of the APM Enabling Change SIG). 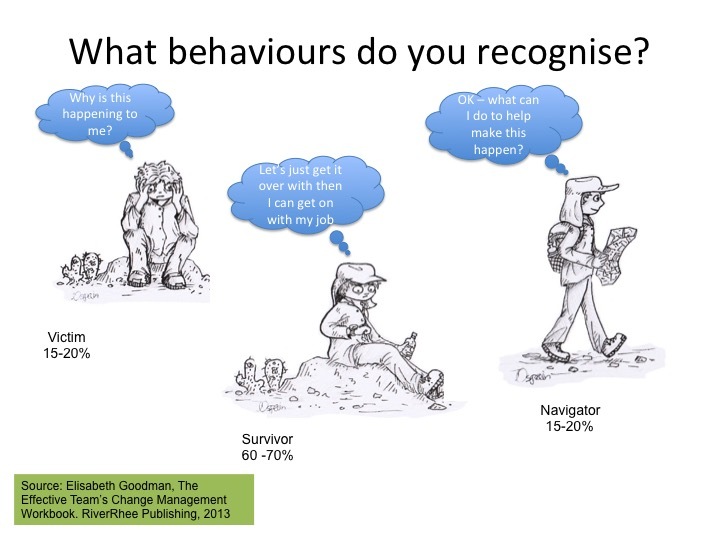 I’ve added in the survivor image to illustrate a point made later by Jacqui Alexander about people’s reactions to change programmes involving long roll-out plans where they might just lie low and wait for it to blow over! 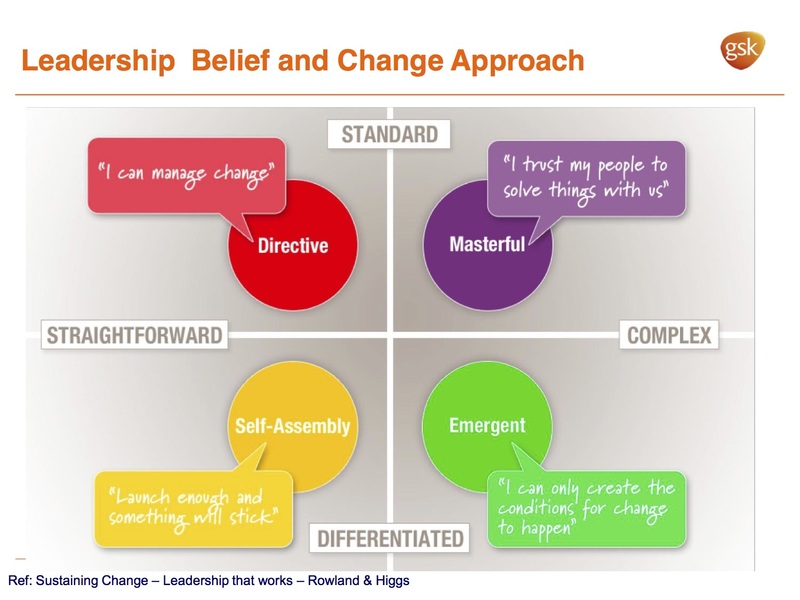 Jacqui Alexander and Margaret Huggins used a four-box model for leadership belief and change, taken from Rowland & Higgs’ book on Sustaining Change that really resonated with the audience and the other speakers. It seemed that whilst the tendency of many leaders of change is to be very directive, it may sometimes be more appropriate to take the masterful approach, and that the most effective may well be the emergent one. The masterful approach engages the people who are doing the work and so will have the best knowledge as to what will be effective. The emergent approach is about creating the conditions for creativity and innovation, mixed with a culture of continuous improvement so that change is incremental rather than evolutionary. It also has echoes of Malcolm Gladwell’s ‘Tipping Point’: when sufficient people have bought into (a) change for it to gain a momentum of its own. At the same time, there are some situations, as in John Burt’s case study with Abzena’s transition in its corporate mission and to a public company, and Madhuri Warren’s case study on relocating and growing their business, when those leading the change have to be more directive, at least at first. Both speakers recognised, and Madhuri elaborated on the fact, that there comes a point when the masterful and emergent approaches are essential for fully engaging their staff. Both Madhuri Warren and John Burt reflected on the qualities of their management teams and how their wealth of experience supported their companies through their periods of significant change. The ability to articulate and communicate their vision for the change to employees and external stakeholders / shareholders, turn it into a sound business plan, project manage that plan, and minimize the negative impact on day-to-day productivity is a complex mix of challenges for any team. Pathology Diagnostics’ and Abzena’s ability to do so are a credit to the quality of their management teams. Both experiences have led them to reflect on their change management strategies, and there was much that GSK shared about their ADP approach (Accelerating Delivery and Performance *) that provided food for thought on this. John Burt referenced the challenge of managing the company’s shareholder based when transitioning to a public company, and the changes in communication strategy that this entails. Chris Mayo elaborated on this further. Managing the internal communications is also an important, as Madhuri reminded us: people want to know the WIIFM (What’s In It For Me) – how the change will directly impact and benefit them. In the panel session we discussed how it is in some ways easier to manage that communication in smaller companies. Jacqui’s suggestion for larger companies is to take a cellular approach to change leadership to achieve this communication more effectively than waiting for the more traditional top-down cascade to happen. Jacqui also suggested tailoring the language for different audiences so for example, in an R&D environment, we might describe a change programme as experimentation! Graham Robb’s book ‘Influencer’ suggests that the best way to influence people is through a combination of skills development and motivational factors, and these suggestions also came through from all the speakers. Robb suggests that effective change depends on identifying the key behaviours that need to change, and then providing the support (skills and motivation) to make that happen. Our speakers certainly demonstrated the awareness, and the approaches that will enable their organisations, and hopefully those of the delegates to continuously change for the better and so not be forgotten! One of RiverRhee’s areas of expertise and courses for One Nucleus is on Managing Change – which was part of the impetus for yesterday’s event. Difficult people are not necessarily being difficult! 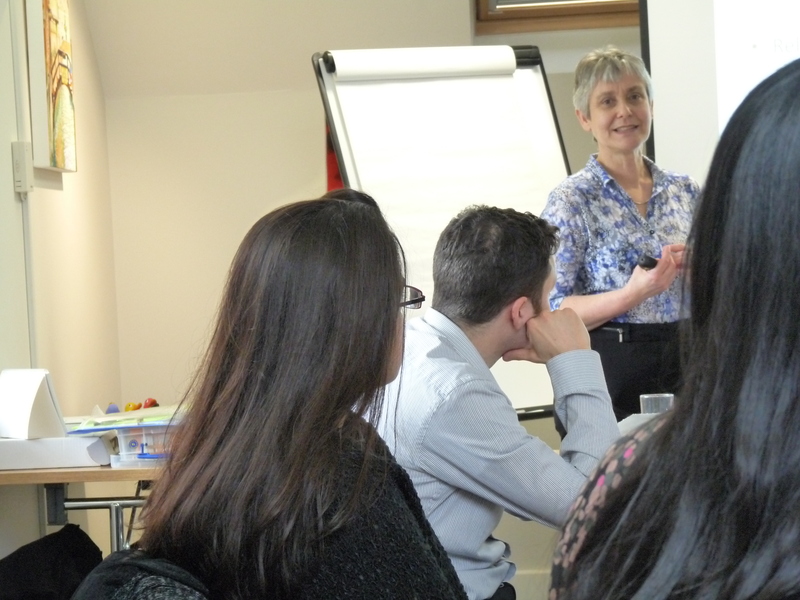 How to work with “difficult” people is one of the topics Janet Burton and I explore in RiverRhee Consulting’s 3-day Introduction to Management course , and in our tailored in-house supervisor and line manager courses. I also previously referred to this subject in one of our newsletters on the subject of creating exceptional managers. How to work with “difficult” people is one of the most popular aspects of our courses, being one that many new and even more established managers can find quite challenging. I wonder whether it’s because the whole area of managing interpersonal relationships, dealing with conflict, emotional awareness and intelligence is something that is largely neglected in our educational system. We are so focused on academic achievement, that this essential aspect of work and indeed home life can be under-developed, unless other people in our lives have helped us to learn about it, or we have taken the initiative to explore it ourselves. As I wrote in the newsletter, difficult people are not necessarily being difficult, but just different! Our different personalities, perspectives on, and beliefs in life will lead us to approach our work differently, communicate differently and generally act differently. At any moment in time, there will also be other circumstances happening in our lives that might be influencing how we think, feel and behave. When faced with what seems to be a difficult situation or person, we would do well to step back and reflect on why they seem to be difficult, and to also step forward into the other person’s shoes. It may indeed be some aspect of our own behaviour that is creating or at least contributing to the situation. We all make assumptions and try to mind read. One of the most obvious solutions, but also the one a lot of people will avoid, is to actually have an open conversation with the person concerned, to understand their perspective as well as communicate our own. Several of the managers we’ve worked with have dared to have those conversations as a result of what they’ve learnt on our courses and have been greatly relieved by the outcome. There are various other strategies at our disposal, such as active listening, coaching and assertiveness that can help us to better understand what is leading to people being “difficult” as well as helping us to influence any associated behaviours and situations in a positive and constructive way. We use various psychometric tools in our training ranging from Honey and Mumford’s Learning Styles, to NLP representational (or communication) styles, Belbin’s Team Roles and MBTI (Myers Briggs Type Indicator). These can be very illuminating in terms of understanding our different perspectives and approaches to life and work. 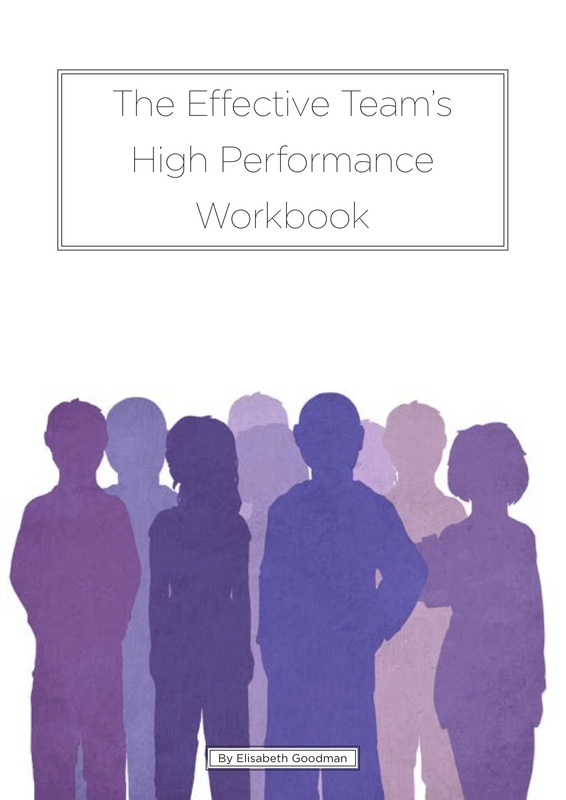 I’m in the process of reading “Working Together”, a book about transactional analysis (TA) in the workplace. TA, and the “OK corral” originated with Eric Berne in the 1970s. It’s about understanding our beliefs about ourselves and how we believe others view us – often something we have inherited from childhood – and how that influences our behaviour and interaction with others. It can lead to individuals being generally passive or aggressive rather than assertive in their behaviour, or to responding passively or aggressively in certain situations. In an organisational setting, the nature of the “OK” dynamic between individuals can influence the dynamics within teams and make a difference between a dysfunctional team and one that thrives on open discussion and attains high performance. The open and positive behaviour of senior and middle managers can make a difference between engaged and ‘empowered’ individuals in what Wickens (1995) calls an “ascendant” organisation, and one where people are alienated, acting in an anarchic way, or where there is total apathy. As one of my own exceptional managers once told me, the work of a manager can be as much as 80% about people, and only 20% about tasks. If people are being “difficult” we should take the time to understand why they appear to be so. The root cause may be something that we can do something about or otherwise influence. As Mountain and Davidson point out: people working together don’t have to like each other to still be able to work effectively together. In my own experience, better understanding can lead to something that is more akin to liking (if that was not there already), and certainly to a more positive working relationship. 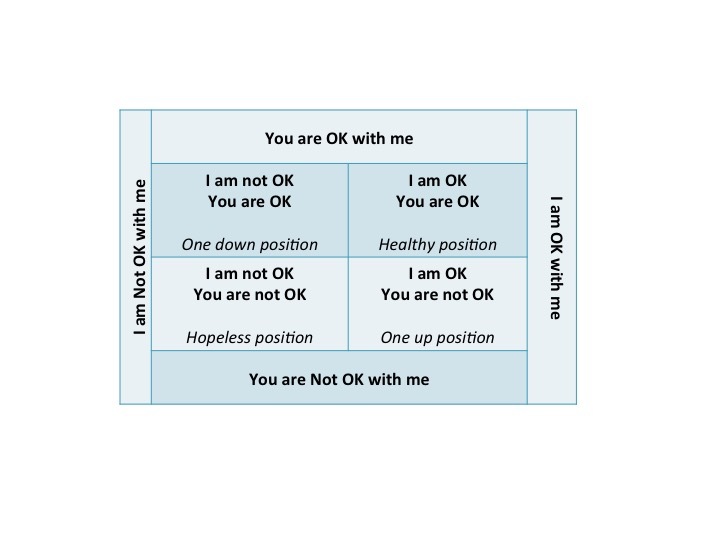 Eric Berne’s 4-box matrix matches the various combinations of “I am OK”, “I am not OK” and “You are OK”, “You are not OK”. The “healthy position” being “I am OK, You are OK”. Elisabeth is accredited in Change Management, in Lean Sigma, in Belbin Team Roles, MBTI (Myers Briggs Type Indicator) and is an NLP (NeuroLinguistic Programming) Practitioner. She is a member of CILIP (Chartered Institute for Library and Information Professionals) and of APM (Association for Project Management) where she leads the Capabilities & Methods pillar for the Enabling Change SIG. 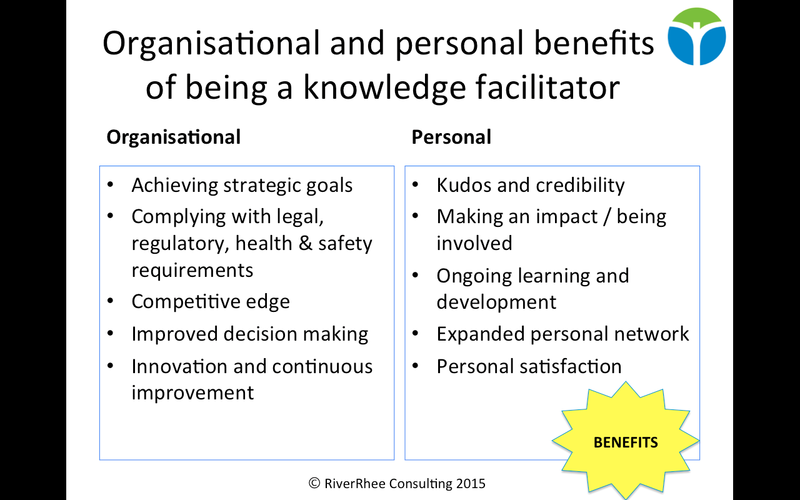 From stoical survivor to natural navigator – strategies for proactive change programme managers. 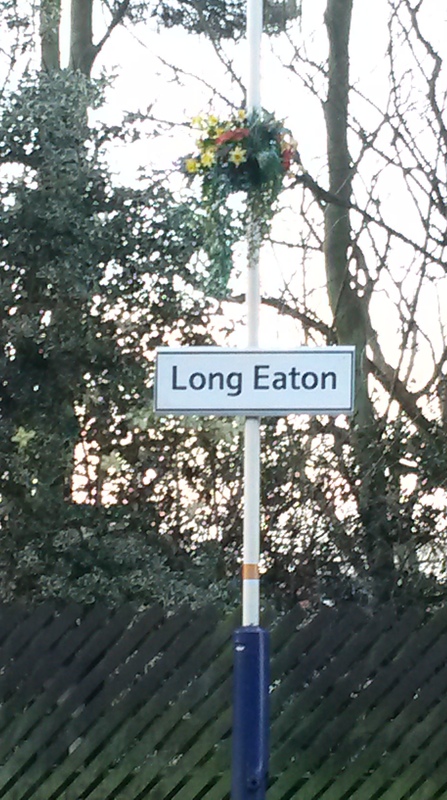 I’ve just come back from delivering a seminar for the Midlands branch of the APM, with my colleague (and Chair) on the APM Enabling Change SIG, Martin Taylor. The event, “How to keep programmes on track and teams inspired during periods of change”, attracted a lively set of people. About a third of them were managing change programmes, another third were supporting programmes in some way and a further third were frequently (!) being drawn into change whilst addressing their day to day responsibilities. This blog reflects some of the points that came up on the theme of proactive management of change programmes. Some of those present mentioned how they would like now and then to have just a few change programmes to deal with at a time. They’d like to see some joined up thinking between programmes, especially where they are affecting the same stakeholders. They’d also like the decision makers to remember why individual programmes are happening in the context of the bigger organisational strategy. 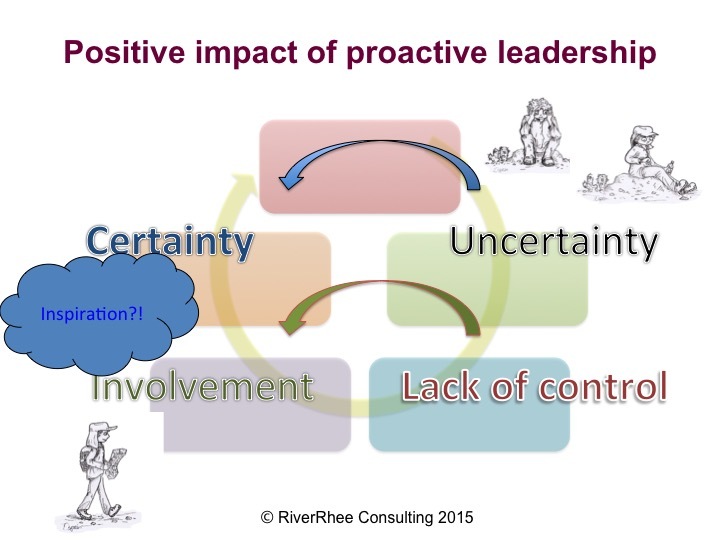 The above proactive approach to change is also an illustration of how programme managers can effectively be navigators rather than victims or survivors of change (terms defined by Richard McKnight and further described in one of my publications – The Effective Team’s Change Management Workbook, RiverRhee Publishing 2013). Being a victim of change, as the name implies, is an unproductive ‘us and them’ mindset where we blame others for the situation we find ourselves in and expect them to sort it out. Whilst we may occasionally need to give way to our emotions in this way, as leaders of change we do, at some point, have to shake ourselves up and get on with it. Stoical survival techniques can also only be temporary. It’s a kind of “in limbo” state where we are only just coping, and it will bring its own stresses. Navigators on the other hand are people who ’embrace’ change and explore what they can do to make it happen in a constructive way: tackling the issues, anticipating the risks, and taking advantage of the opportunities that come their way. In the seminar we also discussed how managers can help their teams to be ‘inspired’ during the changes that affect the team: the sorts of changes that we outlined above. These changes can ‘hit’ the team at any stage of its development: whether newly formed, already storming or in full high performance flow. We discussed how the programme manager can and should adopt the situational leadership approach: being highly directive during periods of uncertainty and ensuring that members of the team have one-to-one time to discuss their concerns and explore their ideas. Members of the team, as much as the stakeholders affected by the outcome of the change programme, will benefit from plenty of communication. We all respond best when we have some degree of certainty and control over what happens to us. Any information, however negative, or preliminary will help towards certainty. Clear roles and responsibilities, and some level of involvement, will help people to feel more in control. If, as a programme manager, you can provide this level of direction and support for your team, you will create the conditions where team members can feel more motivated, become navigators themselves and take more of a leadership role within their own domain of responsibility, and ultimately be more creative and inspired! De Bono’s thinking course. An essential facilitator’s tool? De Bono’s book caught my eye because the methods I’ve already learnt from him: mind mapping, and the “six thinking hats” have become an integral part of the way I work, and the tools that I pass on to others as a trainer and coach, and also as a facilitator. So I was curious as to what other lasting approaches I might learn from him in that vein. The book proved to be a veritable treasure trove and I was delighted to discover that the term for another skill that I’ve enjoyed for years “lateral thinking” is actually one that he coined! 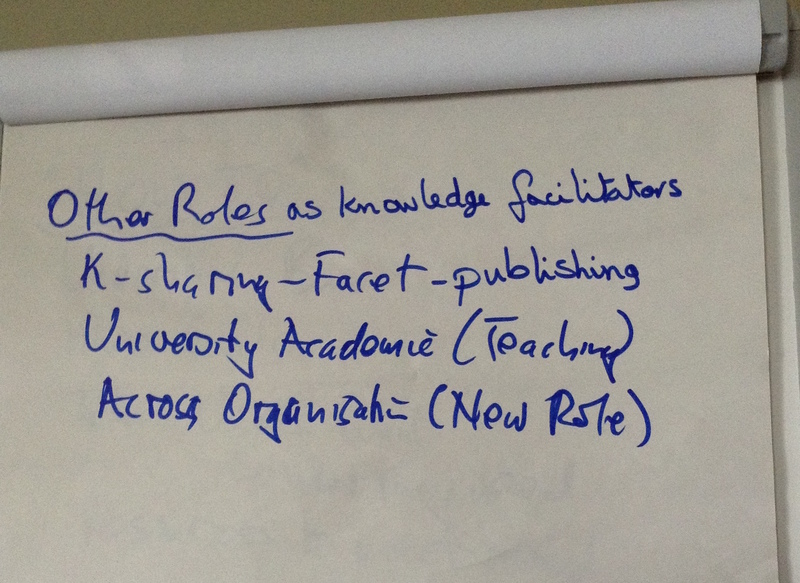 One of the activities I particularly enjoy is facilitating workshops. This is when I create an environment where people have the time, the comfort, and the tools to really think about how they are approaching their work, and how they can do so in a more enjoyable and productive way. De Bono’s “Thinking Course” is all about developing our skill in thinking, so that we are more conscious of which approaches we are using, how we are using them, and how we could use them more effectively in any given situation. As he says, it’s a bit like practising a sport where we might have a choice about which golf club, tennis stroke, or volleyball position to adopt to achieve the desired result. 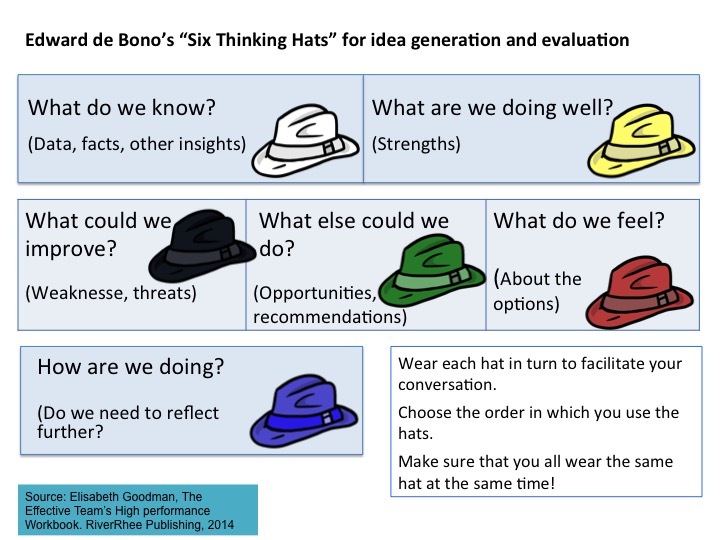 De Bono’s “six thinking hats” (which incidentally is not mentioned, at least in the edition of the book that I read) is a good illustration of this more deliberate approach to thinking. It is somewhat of an introduction, and also a synopsis of some of the approaches in the Thinking Course, although the book also develops these approaches and others more fully. The “six thinking hats” encourage us to objectively consider what we already know (the white hat) and to exercise creative or divergent thinking to come up with new ideas (the green hat). With the yellow hat we look for the strengths of potential solutions, before narrowing down or converging the options by considering what won’t work (the black hat). The red hat allows us to consider our ‘gut feelings’. The sixth, blue, hat is like the director of the orchestra or the facilitator. It enables us to consider how we are thinking and whether we might like to think things through further or differently. In “The thinking course” De Bono encourages us to move beyond the traditional ‘for’ and ‘against’ confines of critical thinking, and the natural limitations of our perceptions and to engage our creativity. He provides lots of tools and exercises for approaches in addition to ‘lateral’ thinking. He suggests a framework for how people might set up “thinking clubs”, which is intriguing in his assertion of how much people can achieve in sequences of as little as 2-6 minutes of thinking. The more creative and flexible thinking advocated by De Bono, and the techniques he suggests should be invaluable for problem solving, decision making, innovation, and thinking in general. I will certainly be adding them to my facilitator’s tool kit. How could you make the most of your thinking? Are you a facilitator and/or interested in how you and your team solve problems, make decisions and innovate? What approach do you take to thinking things through? Elisabeth is accredited in Change Management, in Lean Sigma, in MBTI (Myers Briggs Type Indicator) and is an NLP (NeuroLinguistic Programming) Practitioner. She is a member of CILIP (Chartered Institute for Library and Information Professionals) and of APM (Association for Project Management) where she leads the Capabilities & Methods pillar for the Enabling Change SIG. The same issues arise for managing change, whatever the size of the organisation. There are also some common factors for managing successful change, whether the change involved is IT, organisational or process-based. 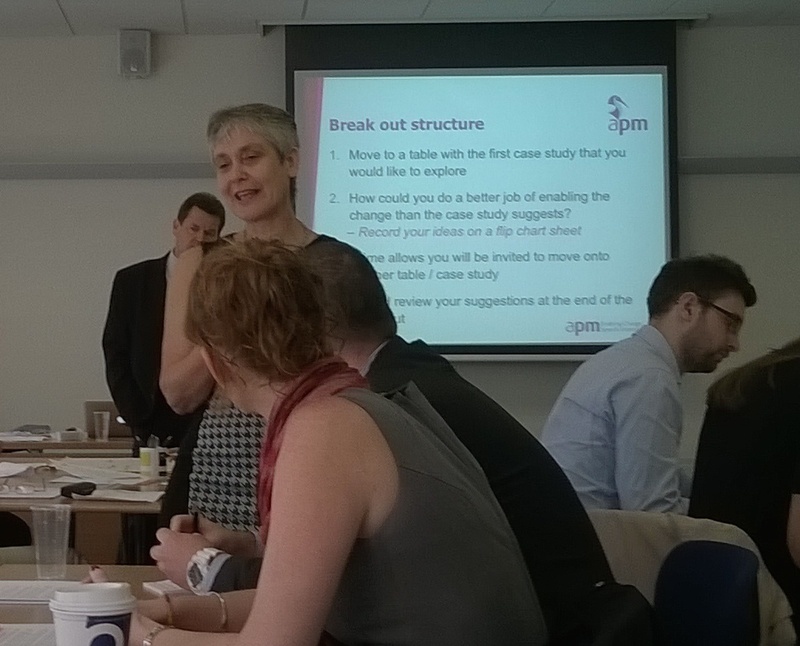 I recently co-led a workshop with Neil White of ChangeVista on behalf of the APM’s Enabling Change SIG (Specific Interest Group). Our brief was to provide an introductory level interactive workshop, with delegates from a variety of backgrounds, in 45 minutes, and to be prepared to repeat it, 3 times! 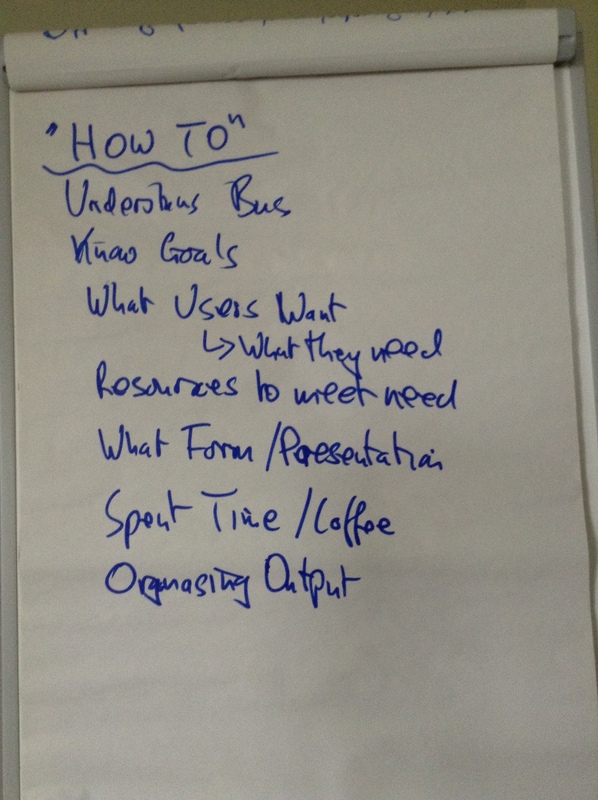 Neil did a great job at consolidating some key principles and perspectives on enabling change into a ten-minute presentation – no trivial task! I set the delegates the challenge of making a better job of three not unusual scenarios for IT, organisational and process change, using what they had learned from the presentation and what they could learn from each other’s experiences. They did a very good job of it! Effective management of change is about involving and informing the people affected so that they can be navigators rather than victims of change. And yet this is the part that is often neglected, either deliberately out of a mistaken desire to protect people from unnecessary worry, as in the organisational change scenario used in the workshop; or, as in the case of our IT scenario, out of an assumption that everyone can learn to use new software quickly, easily and in the same way. What are your thoughts on common factors for managing successful change? All in all it was a very enjoyable and stimulating experience. It was very rewarding to see how many common factors for managing successful change the delegates could extract in an intensive 45-minute session. What else could they have identified?